Figure 1 Oil and gas modelled to be trapped in the oil/gas accumulation to the right. Leftmost bars show volume results for a good reservoir while the middle bars show the results when the permeabilities are reduced with 2 orders of magnitude. This trap is therefore shown to be robust with respect to reservoir quality risk. See figures below for detailed information about modelled retention. Detailed maps of oil and gas column heights, saturations and migration velocities are easily plotted for each timestep during migration. Figure 2 shows one example (left, Figure 1) with laterally variable hydrocarbon (HC) column heights. Modelled saturations and velocities are shown in Figures 3 and 4. Notice how the relatively thick columns with high migration velocities are modelled within the spill path from a deeper trap (green spill path in Figure 1 (right) and red areas in Figure 2). 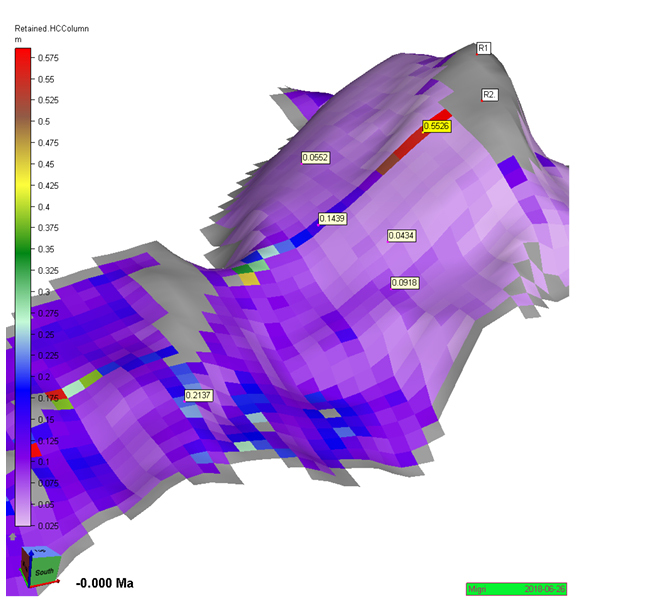 Figure 2 Retained HC column modelled within a good reservoir carrier overlain by a good seal. R1 and R2 are drilled wells which were used to calibrate the source and carrier properties. A spill path is modelled where the modelled column reaches a maximum of 0.5526 m. Outside the spill paths, the HC columns are typically modelled to be less than 20 cm thick in this case. Figure 3 Retained gas saturations fractions for the case modelled in Figure 2. The gas saturations are typically modelled to be less than 10% in this case. Figure 4 Migration gas velocities (km/My) for the case modelled in Figure 2. 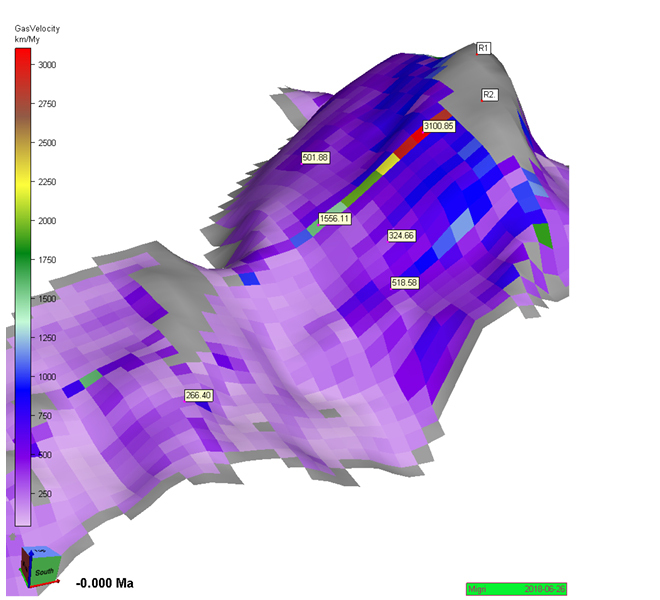 The gas migration velocities are typically modelled to be greater than 200 km/My in this case. Migration velocities reach 3100 km/My within the steepest and most permeable part of the migration spill path. These migration results are computed using the dynamic flow mesh of Migri during migration (see Figure 5 for more details). For each time-step a new dynamic flow mesh is computed and aligned along the migration flow-paths. Within each structural mesh element, up to 9 flow mesh segments are computed. 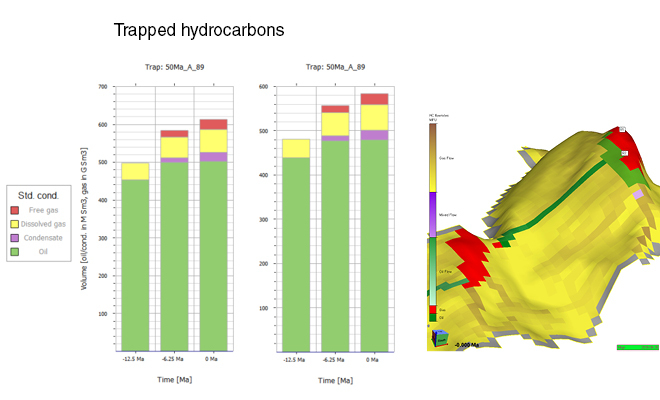 For each of the flow mesh segments, Migri computes the hydrocarbon flow rates, the column heights, the saturations of the migrating phases using the Darcy equation with relative permeabilities for a hydrocarbon stringer. 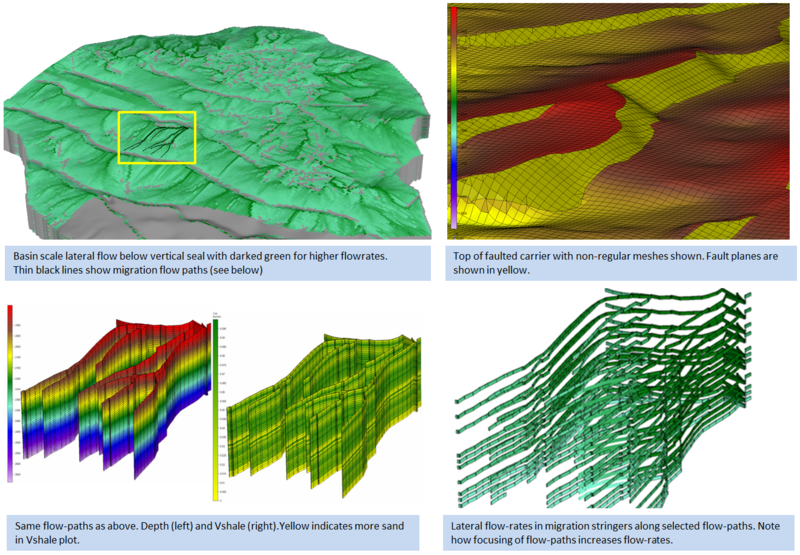 We believe this is a more accurate approach than the full Darcy 3D solution because Migri can model the properties of cm thick migration stringers using the assumption of variable vertical hydrocarbon saturation within each flow segment. If you want to assess the oil and gas retention effects on your own data set, you may consider trying our MigriX (one month free trial is available). Figure 5 Migration stringer modelling in Migri uses irregular structural meshing around e.g. 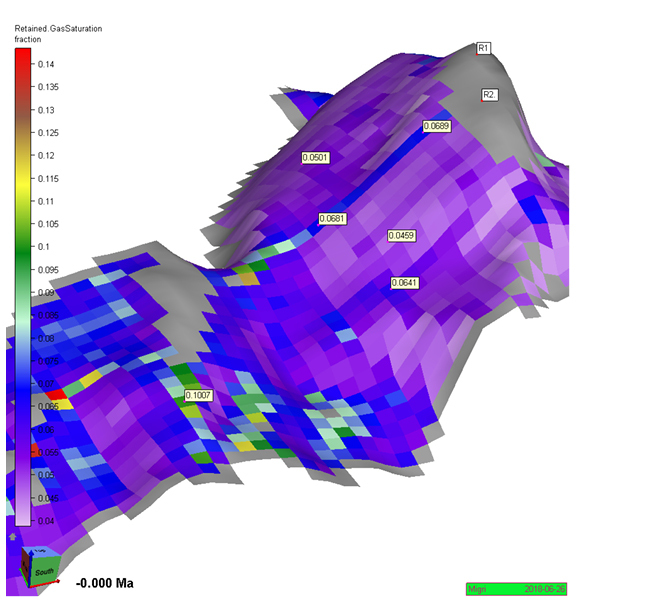 faults (upper right) and a dynamic flow mesh (lower) to allow for accurate modelling of oil and gas stringer heights, saturations and velocities through time.